Note: I joined Amazon as a SDE (Software Development Engg.) Intern on April 8th 2013. I wanted to jolt down my daily experience (atleast the imp. parts) in this blog. But due to certain circumstances, it didn’t happen. Right now I’m heading to office for my second week (in a cab, morning 8am). It takes 1 hour to reach there. So I guess it’s now or never. I reached Hyderabad on the 7th of April. The journey itself was memorable. The transportation was arranged by the travel desk at Amazon. I was provided with a connecting flight from Trivandrum (domestic) to Hyderabad via Bombay. There was a cab waiting for me at the airport. We drove to Redfox, a splendid 3star hotel in Hitech city. Day1: In the first day at Amazon, all new hires are taken through a process called NHO- New Hire Orientation. There were about ten new hires for the session out of which I was the only intern. There were engineers with 13, 14 years of experience working in companies like Dell, Microsoft etc. The NHO consisted of a series of sessions, talks, videos etc. where we were made to understand the guiding philosophies of Amazon. It all stems out of a basic principle: Customer Obsession. We at Amazon are expected to start everything from the customer perspective and think backwards. There are a set of Leadership Principles that are to be infused in the blood of every Amazonian. I was very much inspired by the commencement speech Jeff Bezoss delivered at Princeton College. It talks about the different choices and options that we have. The best I’ve heard after Steve Jobs’s Standford commencement. We were also familiarized with how the various departments such as facilities, transportation etc. worked here. At the end of the day, various housekeeping procedures such as taking photo for id card (which is crucial for moving around here), opening salary bank account, signing of appointment letter etc. happened. At the end, we were directed to our team managers where they are expected to formally (that term is used loosely at Amazon) introduce us to our teams. I was informed that my manager was Mr.Shivakumar and I’ll be working with the transportation and matrices team. I later came to know that Siva was at banglore on business and that he was sort of a senior manager and manages a lot of teams. I called him up and he made arrangements for Mr.Amith to come and pick me up. Amith was to be my new manager. Amith took me to the team- Network Intelligence (earlier known as Transportation Central). They didn’t have a cubicle for me near the team – so I was allotted one at a bit far off place. I was provided with a new Thinkpad T430 laptop and some cool goodies. I filed a ticket for getting a new workstation and within an hour a desktop with 24’ monitor, i5 processor, 8GB RAM etc was set up in my cubicle. The office at Amazon requires a special mention. It is so expansive that I literally got lost a few times the first day. 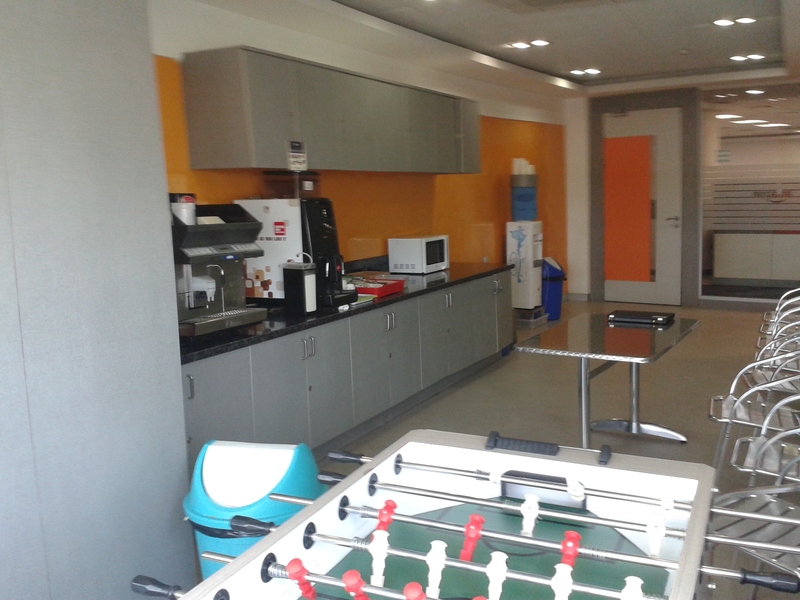 It had world class amenities including cafeteria, breakout room, food court etc. I also met Smita chechi at the cafeteria. She was my senior at college and has been working at Amazon for the past one year. She told me a lot about the work culture here and what I could expect. 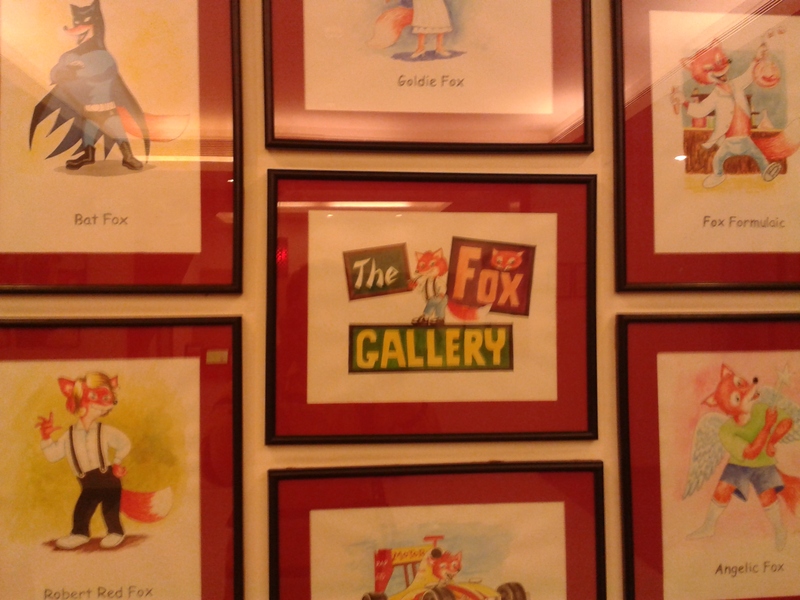 Redfox corridors were filled with hilarious fox art. 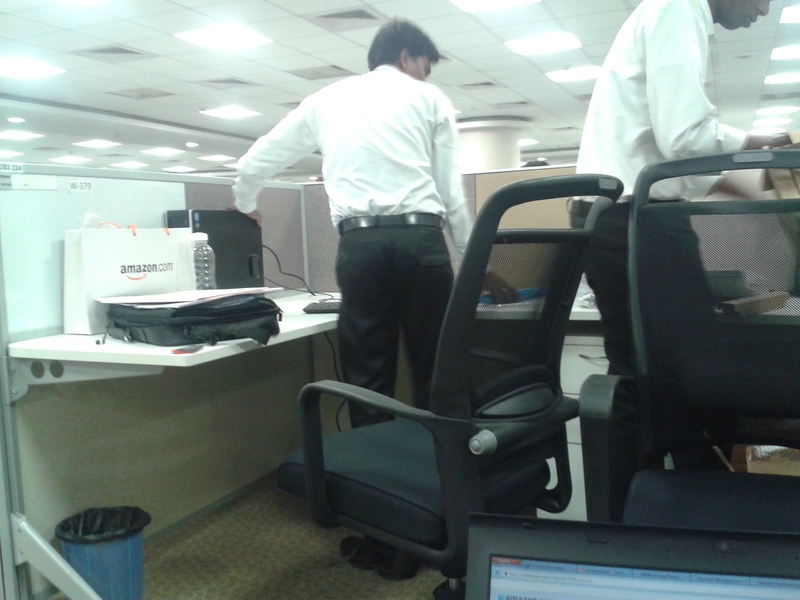 The IT team setting up my desktop. I had a dedicated cab for the first week. The driver was a very friendly person – I call him Khab Shab. (his name was Mr. smObscureWord khan). So I called him up and returned to my room by about 7pm. That was all for the first day. P.S. Got dizzy typing. Ignore the typos. Tried to keep it brief but seems to have become a long rant. I’d try to post the remaining week as a shorter version sometime soon. What is the laptop config given to business team guys? I understand you are a techie..
Goodies included an Amazon-branded t-shirt, bottle and a cap if i remember correctly. These could have changed in the last 2 years. Regarding laptop, we can choose between a high-end windows laptop or a 2015 Mac book Pro (16GB RAM, i7, 500GB flash storage) and additional monitors. Not sure whether the same config applies to business teams. I’m starting work with amazon in a couple of days and I’m trying to prepare for a hassle free first week. One of the questions on my mind is where to park – I was told I have to pay for parking. Are there any parking structures nearby? or do you recommend public transport? any logistics? The parking would totally depend on which Amazon office you’ll be working from. Which one is it? I can check whether there are any specific recommendations for that office. In general, most offices have dedicated company-paid parking. Finally had you converted your intern to full time. If do so what is conversion process? Yes, I got a full-time offer from Amazon. The conversion is primarily based on your overall performance during the internship. I still have 6 months before i join amazon as an intern. Do i need to brush myself up in some particular areas or should i learn something new? Any advice? I don’t think you need to revise anything in particular. Amazon uses internal tools for many things, which you will anyway need to learn after starting your internship. If you are not familiar with git or the concept of version control, that will be worth learning before-hand. What hardware does SDE 2 get now a days? Hi SG, there is no distinction between SDE levels for hardware. All employees in the SDE job family can choose from a 13′ MacBook Pro (i7, 16GB) or the equivalent Windows laptop (Thinkpad iirc). You can also choose between two 27′ HD monitors or a 34′ HD monitor. I have the latter – https://www.amazon.com/Dell-UltraSharp-PXF79-34-Inch-LED-Lit/dp/B00PXYRMPE.